I recently discovered author Elena Hartwell. She spent years in the theater before turning her dramatic skills to fiction. She writes the Eddie Shoes Mystery Series. One Dead, Two to Go, Two Heads Are Deader Than One, and Three Strikes, You’re Dead (launching April 15, 2018). According to Peter Clines, Eddie Shoes is “the most fun detective since Richard Castle stumbled into the 12th precinct.” Elena lives in Twin Peaks, called North Bend, Washington in the real world. The perfect place for a writer, especially one who kills people for a living. Toni LoTempio: Tell us a bit about the Eddie Shoes mysteries. Where did that idea come from? Elena Hartwell: My husband and I were on a long drive and he came up with the name Eddie Shoes. I can’t remember what the conversation was about, or why he made up the name, but I remember thinking, that’s a great name for a Private Investigator! So I began wondering who was this Eddie Shoes? And what kind of trouble could she get into? Toni LoTempio: How do you “get to know” your characters before and while you’re writing the books? Elena Hartwell: I spend a lot of time just thinking about characters. A friend of mine and I made up the expression “honor the mull” – by which we mean, you have to allow for time to let ideas percolate. Sitting down at a computer screen to “write a book” will almost always fail unless you have some idea of what or who you’re writing about. Now that I’m writing a series, I’ve got the basic details of my main characters already in mind, so I get to think about how they change and grow, which is a lot of fun. And also include new characters, which I find come from part people I meet, part people I know, and part me, mixed together with a healthy dose of imagination. Toni LoTempio: How do you construct your plots? Do you outline or do you write “by the seat of your pants”? Elena Hartwell: I typically know the beginning and the ending of my stories before I start, then I write to figure out the middle. Toni LoTempio: Which do you consider more important, plot or character? Elena Hartwell: Neither. They are inextricably linked. I find it easier to write character, so I have to work harder at plot, but you can’t have one without the other. One may take center stage, but stories are never solely one or the other and I think manuscripts that fail, fail because either the plot is weak or the characters are flat. No matter how brilliantly you’ve executed the other, you have to have both. Toni LoTempio: What is the biggest challenge you’ve faced as a writer and what inspires you and keeps you motivated? Elena Hartwell: This is very difficult to answer, because I can’t rank what’s hard about being a writer. There are a lot of things that one has to deal with, which are hard in different ways, learning craft, finishing a draft, then rewriting until it’s as good as you can get it, dealing with rejection, finding a publisher, promoting your books while writing the next one. I guess for me I would say social media is what’s hardest. I’m very much a face-to-face person, I love to do workshops and panels and talk one-on-one with readers. Engaging with people on the Internet is tricky and I have to work very consciously at it. What inspires me is when people I’ve never met contact me and tell me how much they enjoyed my book, or I hear a story about someone who loved it so much they bought ten copies to give away. Learning a reader enjoyed meeting me or hearing me speak or reading my book makes getting out and interacting, whether live or via social media, worthwhile. 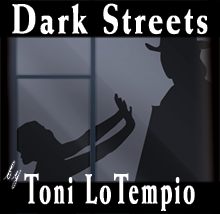 Toni LoTempio: What are you working on now and what are your future writing plans? Elena Hartwell: I’m currently working on book three in the Eddie Shoes Mystery Series. “Three Strikes, You’re Out” launches April 15, 2018. I anticipate other books in the series, so I’m also thinking about four and five and what I might hint at in three that will be resolved down the line. Toni LoTempio: What advice do you have to offer to an aspiring author? Elena Hartwell: Learn your craft. Lots of people write well, that’s not the same as writing a good manuscript. Story structure, genre expectations, presenting yourself as a professional, these things all matter. You may blow up traditional story structure, or write cross-genre, or meet your agent at a casual cocktail party, but you need to understand the underpinnings of this industry before you can make it your own. Elena Hartwell: What’s something readers can do to help out their favorite authors? Word of mouth is huge for authors. If you love a book, tell your friends, or even better, buy them a copy. Write reviews on Amazon and Goodreads and Barnes and Noble and other social media outlets, if you have a blog – blog about us. Follow us on social media and share our information. We work hard at writing, but we often have to work equally hard at promoting our work, and many of us aren’t very good at that!